The Dry Tortugas National Park is now part of the Great Florida Birding Trail, a program of the Florida Fish and Wildlife Conservation Commission, supported in part by the Florida Department of Transportation and the Wildlife Foundation of Florida. This 2000-mile, self-guided highway trail unifies a total of 445 birding sites throughout Florida. This ambitious project features detailed guide booklets and special highway signs identifying Birding Trail sites. From their discovery in 1513 by Ponce de Leon, through the visit of naturalist John James Audubon in 1832, to the present, the Dry Tortugas have been known for their amazing richness in migrating land birds and vast seabird colonies. Imagine, 100,000 Sooty Terns all in one place, all at one time. Thats what you can see if youre fortunate to be near Bush Key in the Dry Tortugas National Park, the Great Florida Birding Trail, during the nesting season each year from March through September. Though Bush Key is closed during nesting, the rookery may be observed with binoculars from Fort Jefferson on nearby Garden Key. 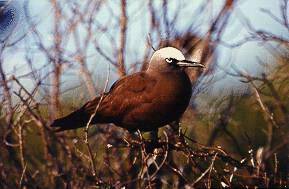 Usually also seen nesting in the rookery are some 2,500 Brown Noddy Terns and occasionaly immature Black Noddies are seen amoung them. Roseate and Bridled Terns are among the many species that feed on fish and squid in nearby waters. Often seen too are Masked and Brown Boobies, Double-Crested Comorants, Brown Pelicans, and magnificent Frigate Birds wheeling in the sky. 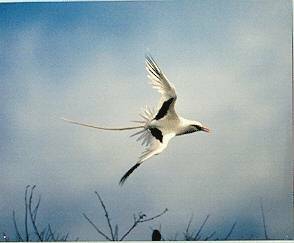 The Caribbean Short-Eared Owl, White-Tailed Tropicbird and Shiny Cowbird drop by sometimes, as do the Red-Footed Booby, the Golden Warbler, and the rare Red-Necked Phalarope, among others rarely observed in North America. The seven islands and islets of the Tortugas National Park lie across a main avian flyway from South America and Cuba to the northern United States. Veteran birders know that in season a continuous succession of songbirds and other migrants flies over or can stop and rest undisturbed on these remote islands in the Gulf Stream. The newly created South section of the Great Florida Birding Trail, which opened in January 2006, completes the statewide Great Florida Birding Trail. This section consists of 116 sites in 12 counties. The following table lists the sites in the order that they appear in the South Florida Section guide, along with county, contact phone number and possible site closures. For an alphabetical listing of birding trail sites by section, visit the Birding Links page. Free guide booklets contain site descriptions, directions, and maps showcasing the wonderful birding opportunities in Florida. Each Birding Trail section consists of a series of clusters, with each cluster containing 1-15 sites.